Celebrating Hispanic Cultural Awareness, Black History and Women’s History. Our shows feature multicultural themes based on the accomplishments of real historical figures drawn from the African American and Latino/Latina experience as well as the unique perspective of Women. These programs can be individually adjusted based on the age of the audience, so that they are suitable for grades K-12. We also tailor our performances to diverse venues and budgets! Please CONTACT US for more information about these programs. 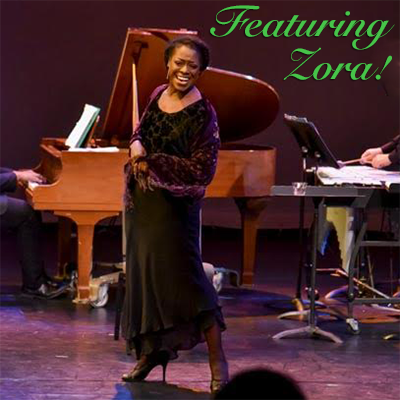 Our program introduces the great writer/anthropologist Zora Neale Hurston at a party celebrating the publication of her first novel, Jonah’s Gourd Vine. Zora tells stories of growing up in Eatonville Florida and shares her personal experiences with racial discrimination. Songs and instrumental music from the Harlem Renaissance period will be featured. Our program introduces the great Mexican painter Frida Kahlo in narrative, music and visual art. We visit her famous Blue House in Mexico City where she tells of her experiences overcoming physical handicaps to become a painter. We see several of her magnificent paintings. Frida sings some of her favorite songs and we hear instrumental music from Latin America. Ain’t I a Woman – A 50 minute program with verbal introductions to vignettes from the lives of Sojourner Truth, Zora Neale Hurston, Clementine Hunter and Fanny Lou Hamer. A question and answer period with the performers will conclude the program. Of Ebony Embers – A 50 minute program with verbal introductions to vignettes from the lives of painter Aaron Douglas and the poets Langston Hughes, Countee Cullen and Claude McKay. A question and answer period with the performers will conclude the program. Los Valientes – A 50 minute program with verbal introductions to vignettes from the lives of Diego Rivera, Archbishop Oscar Romero and Joaquin Murietta aka: Zorro. A question and answer period with the performers will conclude the program. 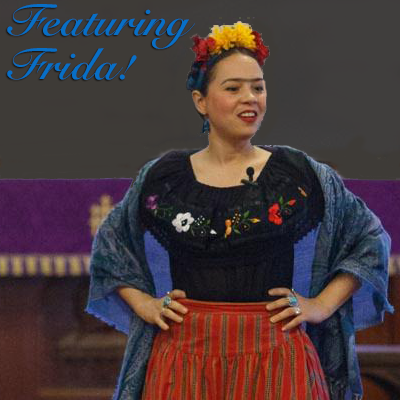 Tres Vidas – A 50 minute program with verbal introductions to vignettes from the lives of Mexican painter Frida Kahlo, Salvadoran peasant activist Rufina Amaya and Argentinean painter Alfonsina Storni. A question and answer period with the performers will conclude the program. In addition to our performances, we offer individual masterclasses for student actors and musicians. 1/2 Day: Up to two programs chosen from performance, student masterclasses. Full Day: Up to four programs chosen from performance, student masterclasses. Multiple Day Residencies can be on consecutive days or involve visits at different times of the school year and with different shows.